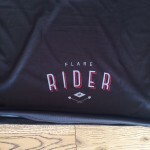 Flare Rider Co is the new sister (or should that be “brother”) brand to the very good female orientated Flare Clothing. Wanting to branch out into Men’s clothing, they launched a Kickstarter campaign to fund the first production run – a downhill jersey and shorts, an enduro jersey and shorts and some technical t-shirts and hoodies. I supported the campaign ordering a downhill jersey and shorts. The jersey arrived first, so that’s what I’m reviewing here. 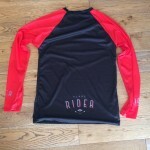 The jersey is made from polyester and is described as “abrasion-resistant, wicking, breathable”. I think they also left out “comfortable”, but I’ll come back to that one in a minute! I’d call the fit close – it’s not tight, but close, which means it doesn’t flap at speed – which is what you need for a downhill jersey. Flare recommend going a size up for armour, I’d say that was definitely necessary. The cut is excellent though, which combined with the elasticity of the fabric means no restriction of movement at all. 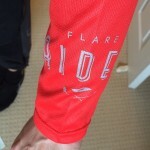 There are lots of lovely design features, like the logo on the sleeve and rear. There is another colour/design in this jersey, which has a more intricate, but subtle pattern at the bottom. Lots of thought has clearly been put into the design. First up that comfort – it’s really comfortable! The fabric is really soft and nicely stretchy – if you need give, it gives. As I just mentioned there is no restriction of movement and it feels super comfy. I ended up with a variety of conditions to test the jersey in, thanks to the Forest of Dean’s micro climate. I wore the jersey with just a baselayer and experienced cool conditions, turning to rain, followed the heat of a steep climb into sunshine! Throughout all of that I was really comfortable. Others in the group were removing baselayers and complaining of cold and heat, but I was very comfortable throughout and could just ride – which is exactly what you want. I didn’t get to test the abrasion resistance of the jersey – sorry but I’m not dedicated enough to graze myself along rough ground on purpose! – however I’ve seen photos of someone doing it be accident! The jersey was barely marked, which is a lot more than can be said for his forearm underneath. I’ll add an update to this review after a longer test period, but initial reports are excellent. The jersey costs £45, which is in line with the competition, but I think is excellent value for the quality. In fact the price is actually surprisingly low when you factor in all Flare’s clothing is made in the UK. 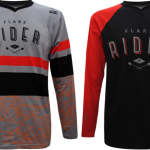 When I first saw Flare’s women’s range I was really hopefully they would start to do men’s clothing, so was an enthusiastic supporter of the Kickstarter campaign. They are a small team who deserve to do well. 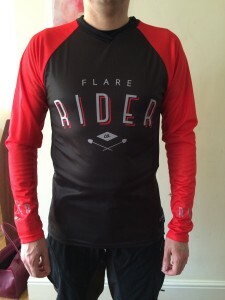 I am very impressed with the jersey and can’t wait for the shorts to arrive.